The Shelters exist somewhere indeterminately between Tom Petty's "American Girl" and the Strokes' "Last Nite", crafting a high-energy blend of garage rock and old-fashioned Americana. On paper, the Shelters seem like they're chasing down tradition rather than acclaim. An L.A. four-piece with anthemic inclinations and a casual, boys-next-door appeal, they play a gutsy, no-frills strain of rock 'n' roll that's already been dissected by legions before them. Deep in their marrow, there's the fuzz-streaked neo-blues of the Black Keys, the heartland-rock romanticism of Tom Petty, and the visceral guitar chug of Steppenwolf. Even deeper than this, there's glam, Allman Brothers' country, the sheer electric firepower of Cream and the Beatles-Stones-Byrds holy trinity of '60s guitar pop. The Shelters refuse to disarticulate these influences for the sake of sonic experimentation; they simply swallow them down, digest them, and bash out whatever melody or riff comes into their heads. They excel at simplicities: pulverizing guitar figures, boy-meets-girl lyrics, choruses that have no real import but that graze truth through endless repetition. 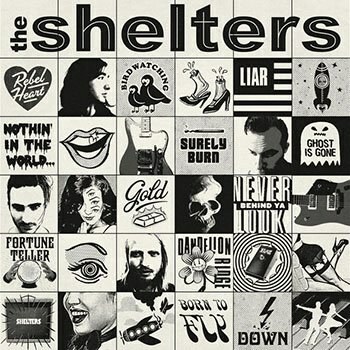 Yet, much like the Strokes, the White Stripes, and other turn-of-the-century rockers that turned genre purism into something ineffably distinct, the Shelters never sound simplistic. They sound vital, fueled by a complex of competing instincts rather than deliberate decisions - a fact that is apparent throughout their debut LP. The hype surrounding the Strokes' debut album Is This It was excessive, fad-driven, and sodden with overeager attempts to anoint the next saviors of rock 'n' roll, but it wasn't inexplicable. The band seemed tailor-made to have its name plastered across a marquee. Fresh out of prep school, decked in Ramones-esque fashion and equipped with an alt-garage aesthetic that was part fuzz, part flair, and all dynamism, Julian Casablancas and his fellow revelers were almost caricatures of the cool-kids-of-rock ideal. Indeed, it was this "cool", this irreducible composite of smoldering brows, taut melodics, and zeitgeist-gripping swagger, that galvanized the mania that surrounded them, not any combination of influences or artistic choices. The Shelters may not be "cool" in the same way, but they possess something similar. They're steeped in convention, nearly crippled by it, but they emit a charisma that's hard to dismiss. The opening guitar-whirl of "Last Nite", the second single from Is This It, was derided by many as a transparent ripoff of Tom Petty's "American Girl". It was, definitively, but the Strokes owed more of their success to Wire, Television, and the Velvet Underground than Petty and his take on bare-knuckled pub rock. There's still a tension between these songs, and it's a tension that explains a lot about the the Shelters' sound. Which is to say, somewhere between the disheveled modern swagger of "Last Nite" and the old-fashioned rock lyricism of "American Girl", you can locate the Shelters' brand of high-energy Americana. Listen to "Rebel Heart", and the band will do this locating for you: propulsive, sprawling, punctuated by barroom piano chords and lithe, tumbleweed guitar, it's a garage-rock ballad belted out over a backdrop of '70s-era pulp romance. "She's got a rebel heart / she's up against them all", singer Chase Simpson wails, and it's easy to imagine this rebellious lover as Petty's "American Girl" cut with an edge, perhaps an edge she developed listening to Is This It over and over again as a teen. "Rebel Heart" may be the most immediately rewarding effort here, but it's followed by a sequence of tracks that affirm the band's live-wire energy. "Liar" begins with a smoldering Cream impression, then transforms into a driving alt-rock showstopper replete with psychedelic melodies and skyscraping vocals. "Never Look Behind Ya" is rollicking Black Keys pastiche that flies through red lights and down gravel roads. Boasting one of the LP's best choruses, "Surely Burn" is perhaps the most glam-inflected cut here, revealing a stylistic dexterity that other back-to-basics rock outfits usually lack. "Will I ever learn / a fire like you will surely burn", Simpson sings, guitar flares flitting past his cheeks. Even though there's no depth to his words, nothing beyond a simple recognition of another's passion, he seems too honest to distrust. As the story goes, Petty discovered the Shelters at one of their live shows, recruited them to help with 2014's Hypnotic Eye, and then co-produced their debut. He may have seen more promise in them than they display here, but The Shelters is undoubtedly the work of bonafide rock 'n' roll hotheads with talent and vigor to spare. Simpson and company may need to find a way to claim relevance in a world that considers them antiquated, but, with only one album under their belt, they have plenty of time before they're asked the decisive question: is this it?